Venn diagrams are today’s mostly used method for solving syllogisms. With some practice they can be drawn fairly quickly making them a valuable tool in solving syllogisms in timed aptitude tests. Get logical reasoning tests that employers use with detailed tips and explanations at JobTestPrep. Venn diagrams show all possible and hypothetically logical relations between a collection of finite and infinite statements. By means of an overlap between some certain assumptions conclusions can be made using the (in)finite statements. Two examples of the use of Venn diagrams will follow to clarify the above. Next, the 1st statement claims: all Canadians are right handed . 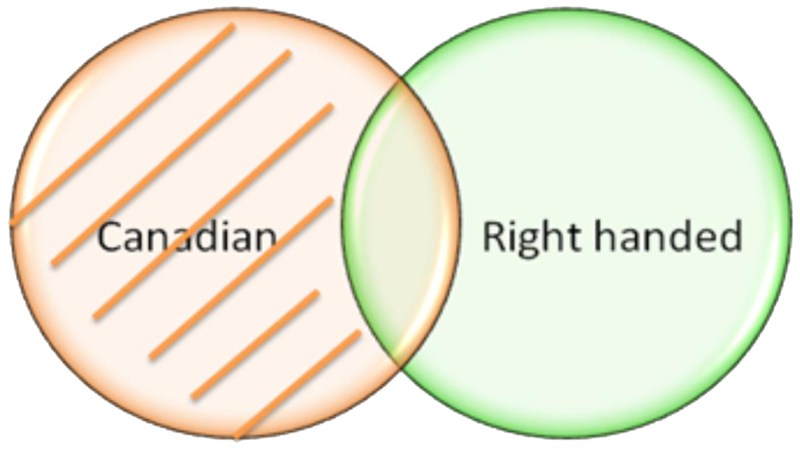 Thus this means that all Canadian people outside the overlap of the two circles are not involved in this statement, since they are not connected to the term right handed. As a conclusion of that this part of the circle is being shaded. It is possible to assign a subject, predicate and middle term for all the statements. However, this would take lot of unnecessary time. Choosing between four statements when solving syllogisms can be handled best by making a Venn diagram straight away. In that way the possible answers from the statements can be checked on their validity piece by piece, resulting in the correct statement. First statement 2a will be examined. 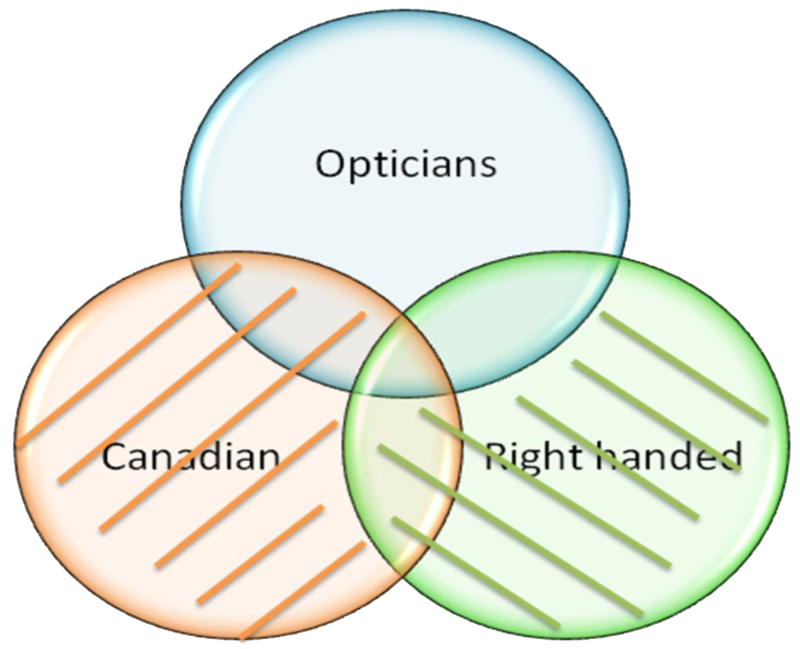 The method behind drawing this part of the Venn diagram is exactly the same as the one explained in example 1, resulting in figure 3. 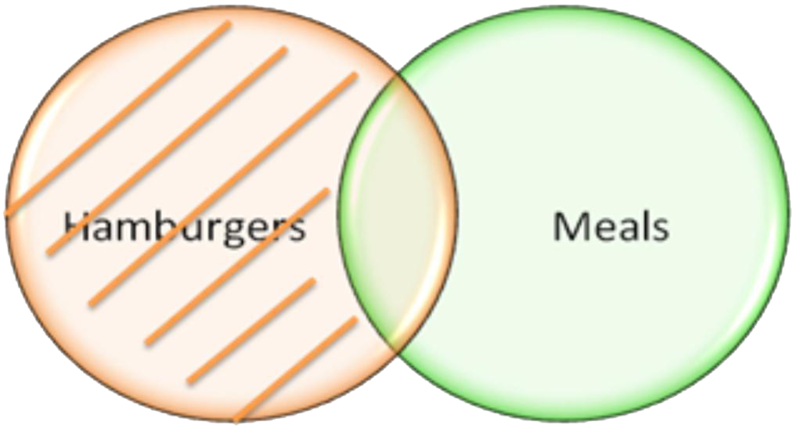 In this way the first part of the Venn diagram displays that all hamburgers are meals, since the part with only hamburgers is shaded to result in the overlap area between the two terms; hamburgers and meals. Next statement 2b is examined. This statement needs a different approach since the statement claims the following: some cows are hamburgers. This means that it is not possible to just shade a whole area as was done before. In order to do that the statement should contain words like “all” or “none”. In this case the statement contains the word “some” and in that case a cross is used to represent that part of the statement in the Venn Diagram. 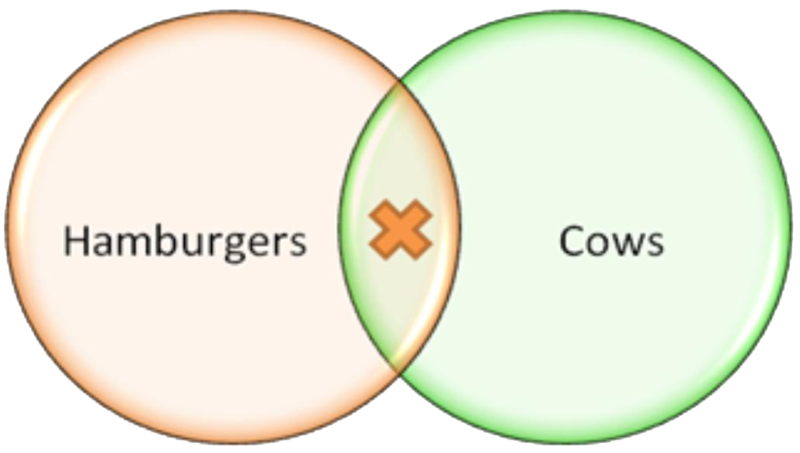 Therefore a cross is put in the overlap between cows and hamburgers, representing the statement that some cows are hamburgers. Linking the two statements and the circles together results in the Venn Diagram of figure 5. With the help of this Venn diagram the 4 statements can be checked for their validity. However it can be seen that the term meals has an overlap with both hamburgers as well as cows, meaning that both are possible en thus resulting in an invalid statement. 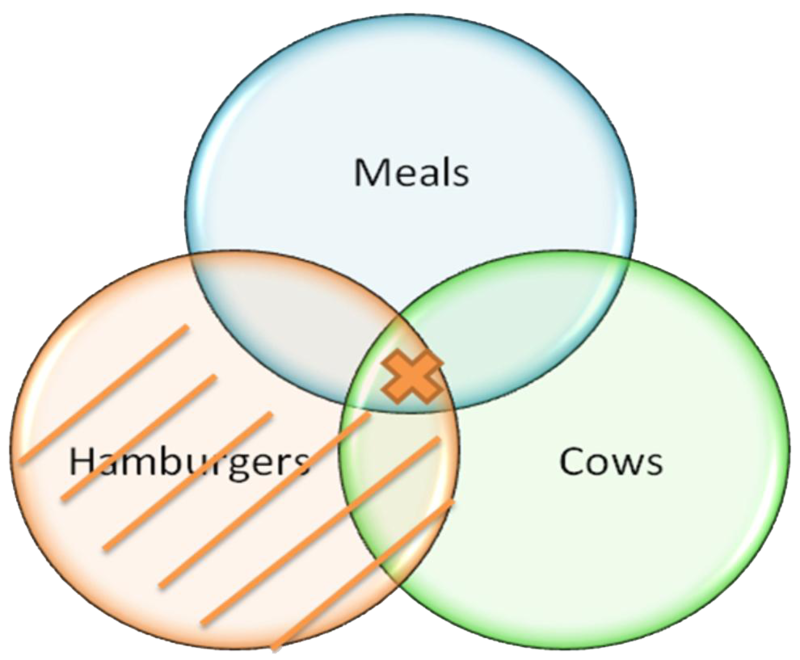 This is correct, since the Venn diagram clearly shows a link between hamburgers and meals (a) and Cows and hamburgers (b). This automatically generates a link between meals and cows (be aware of the fact that there is no link between cows and meals). The Venn diagram clearly shows that this area is not shaded and thus a possible correct answer. It can easily be concluded that this statement is incorrect, since an overlap is present between these two terms. Some cows are no meals. Be aware of the rank of the terms. It was already suggested that some cows are hamburgers, but nothing is stated between the relation of cows and meals. In statement 2 the rank was different so conclusions could be made, which in this situation is not the case. In this example the correct answer is statement 2 . Most syllogisms can be solved by using the above manner. The trick by solving syllogisms is often correct reading and interpreting of the statements and conclusions for obtaining a valid reasoning.